Customer Service Fail: United Airlines Gave Me Meal Vouchers and You Won’t Believe What Made Them Useless! On a recent trip back home to Montana after visiting my sister in California, my family and I got stuck in Denver for the night. Our flight out of Santa Barbara was delayed 4 times, and by the time we arrived in Denver for our connection, the last flight of the night had departed. When I’m faced with such a situation, I usually get on the phone with United while standing in line at the customer service desk. You never know who’s going to be more willing (or able) to help with a delay. After over an hour in line and another 30 minutes at the customer service desk, I walked away with a hotel voucher and $90 worth of food vouchers ($30 per person). I thought we were set, but what happened next caused even more issues! And it made me wish I’d paid for the award ticket taxes and fees with a credit card that provides trip delay protection. I’d decided to use the United℠ Explorer Card for the free checked bags instead. 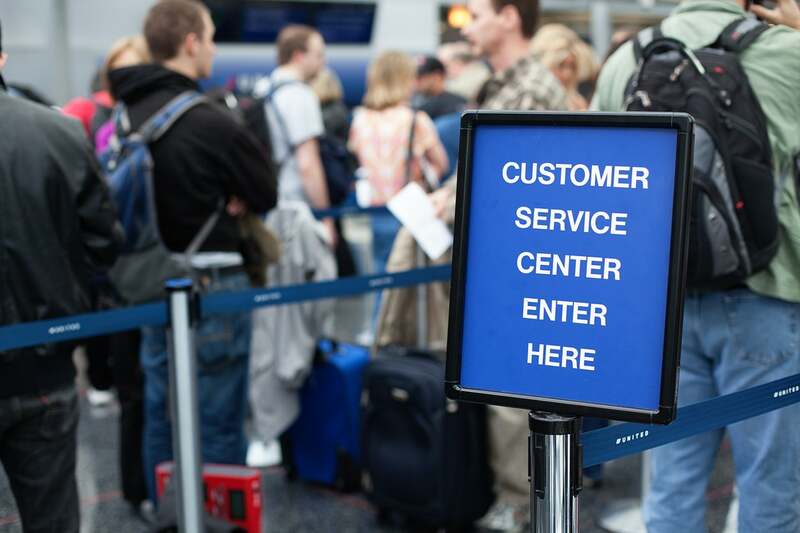 Why Is It That There Always Seems to Be a Line at the United Airlines Customer Service Desk? Most everything in the Denver airport seems to shut down by 10 PM. When we left customer service it was about 9:50 PM, so we rushed to the nearest sandwich shop we could find. We got our order in just before they closed and I handed the guy my vouchers to pay. After a couple of minutes, it was clear that something wasn’t right. The cashier called over two other employees and each of them tried unsuccessfully to scan and type in the meal voucher codes. I was frustrated after having already waited hours to get the dang things, so I couldn’t believe it when one of the employees pointed out that the vouchers wouldn’t work because they were printed upside down. WHAT?! Knowing we wouldn’t have any other way to get dinner I paid for our meal with a credit card so we could be on our way. And I’m glad I did because it took us another 1.5 hours to get shuttled and checked in to the hotel. I sent an email to United Airlines customer service and I’m still waiting to hear back. Any guesses as to what they’ll do? I don’t know what to expect, but next time I’ll know to check my vouchers before leaving the customer service desk! I’m also just really puzzled as to why the vouchers being printed upside down would make them unusable. The whole system seems a bit archaic! Have you ever had any issues with meal vouchers, or even flight vouchers, you received as compensation for a delay? Tell me about your experience in the comments below! Ready to take your travel to the next level? Then subscribe to our newsletter and get the latest miles & points tips delivered daily. I’m having trouble picturing how an upside down voucher couldn’t be flipped over to right side up. Pics? You can’t have pics of something that never existed. Craziest thing I have ever heard concerning vouchers. Should have told the guy to insert them into the reader upside down. Problem solved. Seriously though, it’s true about DEN – no food served late (even the free stuff at that restaurant way up there) even though plenty of flights are still scheduled pretty late. And I hope United comes through. Sounds like (at least) a 10000 miles error to me. The overwhelming majority have said you are full of crap. I believe it’s oozing from your ears, but that’s just me. Wait until the common sense people start chiming in. Hopefully, they won’t be as kind.